One word to describe this pizza-amazing! 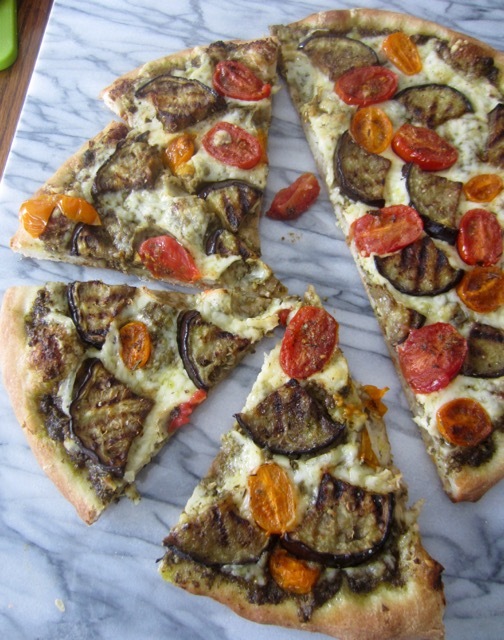 Make sure you season the tomatoes and use good quality olive oil to grill the eggplant. If you thought you could never be a vegetarian, try this one. 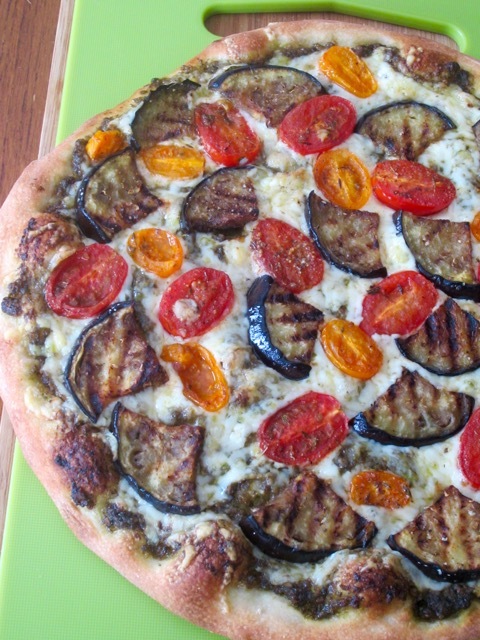 You will be glad to have a meatless-Monday-Pizza! Anyway why do people have their meatless days on a Monday? Have a lovely Saturday!!! Preheat the oven to 450ºF (230ºC) if using a pizza pan or 550ºF (290ºC) if using a pizza stone or as per instruction on you pizza dough packet. If using a stone, preheat the oven with the stone inside, on the bottom rack; if using a pan use the middle rack. The pizza will bake in 8-15 minutes depending on your oven. Place tomatoes on a plate cut side up and season with salt and freshly ground pepper. Sprinkle dried herbs over, and drizzle with a little olive oil. Set aside. Place a grill pan on the stove top and heat until hot. Brush eggplant slices with olive oil, season with salt and freshly ground pepper and grill 4-6 minutes on both sides or until they have nice char marks. Set aside to cool on a paper towel. Roll or stretch the pizza dough and place on a lightly greased pizza pan or a pizza peel sprinkled with corn flour or semolina, if using a pizza stone. 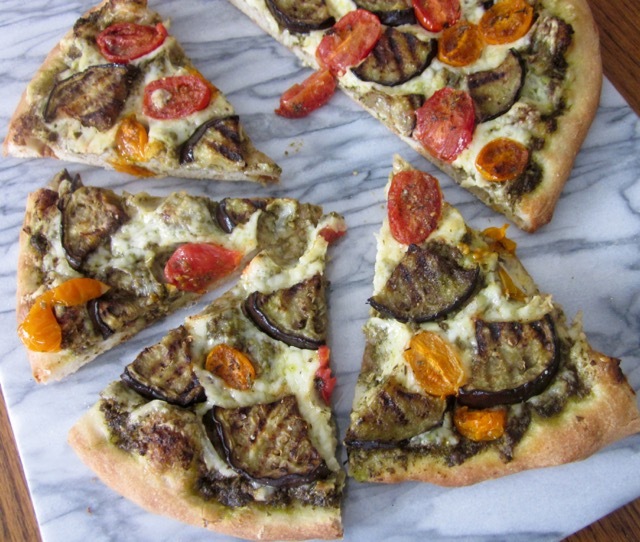 Spread the pesto over the pizza crust. Sprinkle the Parmesan over the pesto and then top with the grated mozzarella. Arrange the grilled eggplant and tomatoes. Transfer to the oven and bake until the crust is golden brown, 8-15 minutes depending on your oven. Place tomatoes on a plate cut side up and season with salt, freshly ground pepper and dried herbs. Drizzle with a little olive oil. Set aside. Brush eggplant slices with olive oil, season with salt and freshly ground pepper and grill 4-6 minutes on both sides or until they have nice char marks. Set aside to cool on a paper towel. Top with the grated mozzarella. 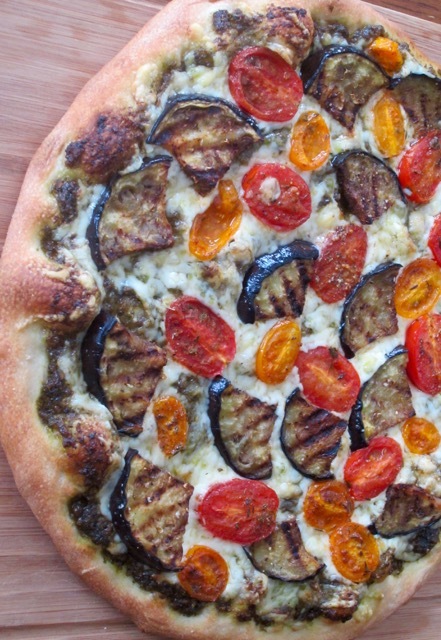 Arrange the grilled eggplant and tomatoes. 318g ball of dough rolls easily to 11-inch really difficult to stretch to 12-inch unless you’re using a pizza pan where you will not need to transfer the pizza. Pesto 1/4 cup covers well; 2 tablespoons of Parmesan. Next What is Oat Groats? i absolutely love brinjals and make severals off them from my garden !! I also love brinjals. If I had them in my backyard, I would eat them every single day. They are quite expensive in-store! Mm interesting that monkey are feeding on them. I love the purple ones. Are the green ones small and round?